Commercial real estate activity in New Orleans cooled down in the first quarter of 2013, after a heated 4th quarter in 2012 when buyers hurried to close by the end of the year. 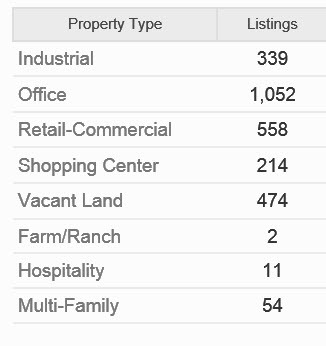 In the office market there is 5.3 million square feet available for sale and for lease, as of the end of February 2013. Office lease offerings were 909 sites totaling 3.9 million square feet, up 10% from the average the last 12 months. Office property for sale was about the 12 month average at 143, or 1.4 million square feet. In February 2013, 22 properties were leased averaging $18 per square foot and two were sold averaging $69 per square foot, down 15% from the asking sale price. The New Orleans MSA average office asking lease rate at the beginning of the 4thQ 2012 was $16.10 per square foot, higher than the state average but lower than the city and parish asking prices, as shown in the chart below. The average office property that sold or was leased was on the market 556 days, twice the average of 287 days, so some of the more difficult office properties that have been on the market a long time have finally found new owners. That is a typical sign of a healthy market. The average asking sale price for office property in the New Orleans MSA was $103 per square foot at the beginning of the 4thQ 2012, about 10% higher than the state average and 25% higher than the city average, as shown in the chart below. For U.S. Census purposes, the New Orleans MSA includes seven parishes: Jefferson, Orleans , Plaquemines, St. Bernard, St. Tammany, St. Charles, and St. John the Baptist, and has a total population of 1.17 million. 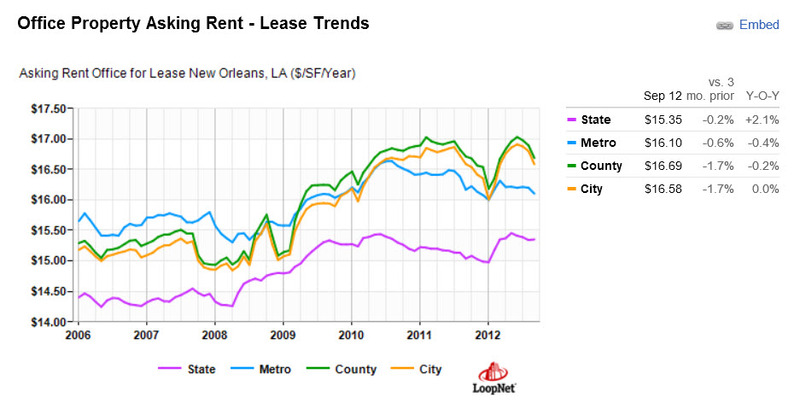 For a refresher on last quarter’s trends in New Orleans commercial real estate, see our newsletter at: http://www.louisianacommercialrealty.com/2012/11/trends-in-new-orleans-commercial-real-estate/. In our next issue, we will cover the trends in other New Orleans commercial real estate categories: industrial and retail.